MERIDIAN is Heavy Metal band from Esbjerg, Denmark founded in 2005. They have released 2 EPs "All the World's a Cage" of 2007 and "Inside The Machine" of 2009. 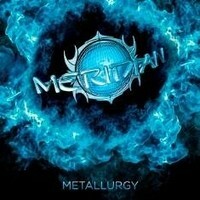 Their album “Metallurgy” is about to see the light of day really soon. “Introminator” commenced the band’s attack with a decisive piece of Metal, a splendid intro to let your head roll. My favourite track is “Between Love and Hate” where the skins pound mercilessly with excellence, melodious heavy weight riffery, ultimate catchy chorus with uplifting melodic singing Melodic providing a mixed sense of Heavy and Power Metal. “Human Price” charges with fast tempo stampede, having you memorizing its peak chorus moment, striking it as a tuneful song. “My Enemy” is a sort of an epic Heavy Metal track, garnering many influences while appearing similar to the robust energies of PRIMAL FEAR. On the other hand, the guitaring, whether meaty or atmospheric, show evidence of impressive ideas, like drilling hard into your soul bearing influences of DIO and BLACK SABBATH but with modern inducements. “Only the Strong” is a continuance of what I just described The band’s tightness and sound are a kicker while also proving that there is a damn well made frontman singing the tunes with plenty of emotive flashes. “Frozen in Time” and “The Machine” are mechanized warmongers with a pounding rhythmic section while “Seeking Immortal Life” distributes the old JUDAS PRIEST feel & fantastic melodic singing, yet mixed with a bellyful of AOR. Worth to listen are also: “Narrowmind” with heavier Rock riffs, energy & changes rate finding IRON MAIDEN and melodic riffs with diverse signatures on “Red Horizon”. MERIDIAN play fantastic Heavy Metal with catchy melodies, impressive guitar riffs, incredible solos and on hell of a vocal line. Heavy Metal received a wonderful version with their offering. This band is really interesting. Highly recommend for every fan of melodic Heavy Metal. I'm looking forward on their new songs in the future and wish to see them one day on stage on gig. Possibly that I feel for their music, they got themselves a new fan.